WARNING: This is not for beginners. I’ve been in the lab again. I’ve been testing more crazy, but effective metabolic workout finishers with my clients and they have been crushing it. In fact, I’m going to share one with you that I want you to try at the end of your next workout. Then I want you to let me know how it goes. If you think you’re fit, then I have yet another challenge for you. My friend and strength & conditioning coach, Yuri Elkaim, has just released a new intense workout program where he promises to get you in the best shape of your life in just 4 weeks. Yuri’s a former professional athlete and has gone through training regimes that most people could never even imagine. And he’s worked with many of top collegiate athletes in the country – helping them go from fit towhat he calls “Warrior Fit”. Whether you want to train for an adventure race or just take your body and fitness to an entirely new level, this will help. Plus, it’s an intelligently designed program providing you with the minimum amount of exercise needed to produce crazy results, while avoiding burning yourself out. No more 2-hour workouts, 6 days a week. 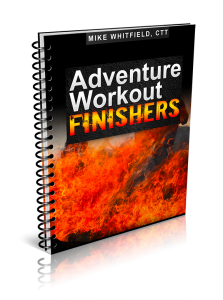 Oh..and because this is the official release of Yuri’s Unstoppable Warrior Adventure Workouts he’s allowing you try it out at a whopping 50% discount. By the way, this 50% sale ends on Thursday at midnight. What might look easy on paper is tougher when APPLIED. There are two methods I’ve been getting obsessed with recently when writing finishers… and that is the countdown method and the density method. Today, it’s all about the countdown method. We’ll talk about the density method soon enough. What is the Countdown Method? This is when you start a circuit or superset with a certain amount of reps (let’s say 8 for example). Then in the next circuit, you perform 7 reps of each exercise. You continue in this fashion until you complete 1 rep of each exercise. This is also known as the ladder method. The real kicker – the rest periods are set up like this: You rest ONLY when necessary. The addicting method to improve your conditioning – record the time it takes you to complete the finisher. The next time you perform the finisher, try to beat your previous time. I know, I am. Thanks for pointing that out Mr. Imaginary Person. You rock. *The Burpee/Spiderman Pushup Combo is a tasty metabolic sauce in which you perform a burpee, but once you’re in a pushup position, you complete a Spiderman Pushup (1 per side) then bring your feet in and then stand back up. 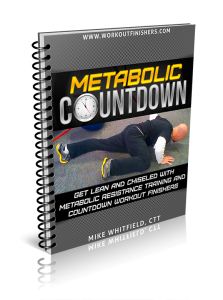 So, thanks to my obsession, I created a new metabolic resistance training program called “Metabolic Countdown”, which, surprise surprise, is a metabolic resistance training program with every workout ending with a countdown workout finisher. 2. Forward your receipt to us at cranktraininghelp@gmail.com, and we’ll send you the FREE bonus Metabolic Resistance Training program, “Metabolic Countdown” with every workout ending in a countdown grand finale. Warning though – this is NOT for beginners, just like Yuri’s program. You can grab Yuri’s program by clicking here. Thanks for this. I am a wellness fanatic and it’s essential to me that people study ways to eat right and remain healthy. The majority of the globe does not always concur so it’s excellent to see info like this out there!